For at-home on-ear headphones there's plenty to like about the BeoPlay H8. But if you want a more natural listen with less of a bass-in-your-face experience then there are plenty of alternative options out there. And ones without such a sizeable price tag. 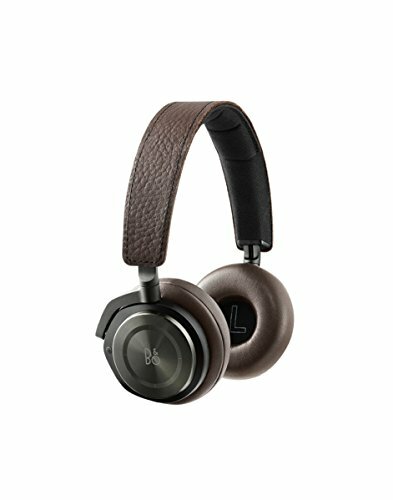 In the hunt for a decent pair of headphones, it's logical to select a well-known brand such as Bang & Olufsen. The Danish high-end audio manufacturer's most recent noise-cancelling on-ear headphones, the BeoPlay H8, certainly look the part, but with a £399 asking price are they worth equally high praise? The answer is a mixed one, as we've come to realise from weeks of ongoing use. The H8 on-ears really aren't going to be headphones for everyone and, as we'll come to later, aren't particularly well-suited for those who like to march around while listening to music. Yet their booming bass, crisp sound and Danish good looks make the B&O BeoPlay H8 worthy of attention. Read on to find out if they could be your ideal on-ear suitors. Bang & Olufsen doesn't muck about when it comes to materials and finish. That's evident in the BeoPlay H8, with their solid aluminium frame, elegant hinges connecting to leather-clad soft earcups; along with a firm foam-padded material headband, again topped with a hardened leather exterior. The B&O logo which resides on the earcups' outer edges is subtle compared to some competitors' excess branding. The right side of the H8 houses gesture controls, marked out with simple lines that are barely visible, which we've not found a great deal of use for given the odd sensation of fumbling a finger around the side of your head. Tucked around the rim is the noise-cancelling and Bluetooth on/off, and a micro-USB for charging the on-board battery (which lives on the opposite left side). All in all the BeoPlay H8 look great. It's no surprise to see them hanging around the necks of suited-and-booted Danes with fashionista stubble that most chaps could only dream of deploying on their faces. That's B&O marketing for you. But we're not just sucked in by such poster campaigns, as having lived with these headphones we can see the positives. However, when actually wearing the H8 there are a few downsides. It's as though Bang & Olufsen has gotten swept up in making its headphones look so great that they've forgotten to road-tested them properly. First up is the distribution of weight. At 255g all-in the H8 on-ears aren't hefty, but as the headband seems to weigh roughly equal to the lower earcups, it's not unusual for them to come hurtling off the head if, say, you bend over to pick something up. Which isn't ideal. The fit isn't particularly tight, but that helps maintain enough comfort without the sort of pinch associated with Sennheiser on-ear equivalents. Secondly there's an issue with resonant feedback. Walk down the road and every step you take - cue The Police - adds a dull thud, almost like a bassy kick drum. If you walk in time to 4/4 house music then, hey, you might not notice, but for other genres, it's a real pain. Which gives us the impression Bang & Olufsen has made the H8 primarily for at-home use. When we first donned the H8 on-ears a number of weeks ago the first thing we noticed was their huge bass response. For these small-by-appearance 40mm drivers to deliver quite such huge low-end is impressive. Perhaps it's too huge for what one may expect from the Bang & Olufsen brand though. Not that we dislike bass, we're actually rather fond of it - but for a fully natural listen that's not what's conveyed from these headphones. The overall sound remains high quality though. The 20Hz-20kHz response covers every nook and cranny of frequency you'll ever need (and, technically, beyond it), assuring crisp highs and clapping mids with clarity. The balance may be bass-heavy, but the full mix of any given track still pushes through with gusto. The real treat from the H8 is the active noise-cancelling technology. Unlike many competitors where wind can cause a "tearing" sound, the H8 doesn't suffer from such an issue. With the active noise-cancellation activated via the switch, outside sounds are muffled considerably; it's like immersing yourself in a deep pool of water. We found the effect most prominent when flying a long-haul flight - the headphones cut out the fizzing hum of the air con and engines almost entirely (but not quite the whining children in front). Until, that is, the battery came to the end of its charge. When this happens it's not a clean transition from on to off, instead distortion and crackling settles in, which is a surefire reminder that a re-charge is needed. In terms of battery longevity per charge you will achieve double-digit hours of use no problem. B&O claims 14-hours maximum, which is a fair assessment, depending on how loudly you like to listen to your tunes. And that's one thing the H8 is most certainly capable of: considerable volume. When the battery does deplete it can be easily recharged via the micro-USB slot using the included cable. Don't have it to hand, then simply use the headphones passively instead, where they deliver much the same quality. The Bang & Olufsen BeoPlay H8 on-ear headphones look great, hammer out bass, and their active noise-cancellation is brilliant. But for £399 they're not cheap. And considering the feedback that can enter the earcup enclosures when, say, walking around, our praise isn't quite as lofty as that considerable price tag. We like the Beoplay H8 and continue to wear them at our desk day in, day out, soaking up the bass. But, and despite their inherent positive qualities, they quite simply won't meet everyone's expectations.